One recent accident in Germany and the release of a Service Inquiry into a UK Mid Air Collision (MAC) highlight the importance of managing MAC risk. The UK Military Aviation Authority (MAA) consider MAC to be one of the highest risk hazards in military aviation (as discussed in para 5a of their 2012-2013 Annual Report and highlighted in their first annual report, for 2010-2011). In fact, of the five 2* Operating Duty Holders in the UK military (three RAF, one RN and one Army), four consider it to be their ‘top risk’. Between 2008 and 2012, the MAA report that 48% of all Airproxes in the UK, examined by the UK Airprox Board, involved military aircraft. Definition of an Airprox (ICAO Doc 4444: PANS-ATM): An Airprox is a situation in which, in the opinion of a pilot or air traffic services personnel, the distance between aircraft as well as their relative positions and speed have been such that the safety of the aircraft involved may have been compromised. One sad illustration of the devastating consequences of MAC, can be found in the Service Inquiry (SI) published on 30 June 2014 into the MAC involving Panavia Tornado GR4s ZD743 and ZD812 over the Moray Firth in Scotland on 2 July 2012. The two aircraft, both from Operational Conversion Unit XV(R) Squadron based at nearby RAF Lossiemouth, were operating independently and collided at 920ft above the sea in Class G airspace. Three of the four crew perished. The survivor, injured during ejection, was recovered by RAF 202 Squadron Westland Sea King HAR3 after 75 minutes in 12ºC water, wearing flying coveralls (but not an immersion suit). While the associated text is relatively heavily redacted it is clear that his core temperature had dropped to a critical level. The report highlights that UK military sea survival regulation and RAF survival policy were out of date. The continued lack of automatically activating 406MHz beacons for fast jet aircrew is another point raised (even though the international agreement to only monitor for 406MHz using the COSPAS-SARSAT satellite system was made in 2000 with 8 years 4 months notice of the 2009 implementation). A number of other observations relate to the Search and Rescue activity. The 300-page report is particularly critical of the processes within the MoD, which meant that procurement of a collision warning system for the Tornado fleet was repeatedly delayed, deferred and at one point deleted. This is no great surprise as it has been a matter of long running interest in parliament and the subject of discussion in past MAA Annual Reports. The report does however examine this saga in critical detail. However, a CWS such as ACAS2 (already fitted to the BAE Systems Hawk T2), is only a final line of defence. Other hardware defences were found wanting. The local military Secondary Surveillance Radar (SSR) was unavailable due to scheduled maintenance and one aircraft had an unserviceable Radar Homing & Warning Receiver (RHWR). While unrelated, the SI also highlighted short comings in the safeguarding of the SSR and navaids. 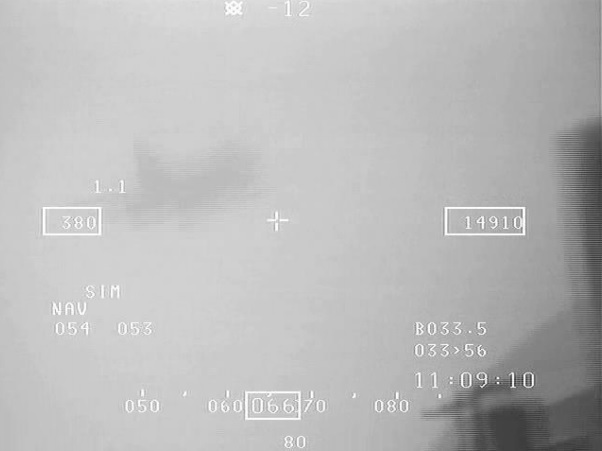 The SI identifies ‘procedural drift’ in the air weapons range procedures and practices as another contributory factor which reduced the situational awareness of each crew. A number of non-contributory supervisory, procedural & record failures and engineering non-compliances are identified in the report. Ineffective assurance of the unit was however identified as a contributory factor by the SI Panel. It was also noted that the risk management processes in use by the Duty Holder’s were still maturing and it was commented that new MAA regulation in the area was offered as an ‘excuse’ for insufficient attention on the risk of MAC. Within a few hours of publication, the press began to focus on the fact that one of the crew was suffering from ‘fear of flying’ (example article). The handling of this anxiety condition was inadequate and it was noted that there were similarities to inadequate medical handling of one RAF pilot in a 2009 mid air collision between an RAF Grob 115E Tutor and a civilian glider. The SI notes that the UK Civil Aviation Authority (CAA) stated that in such a condition a civil pilot would not be allowed to continue flying while under treatment. It was a 2004 airprox between a Tornado and an AS332L helicopter in uncontrolled Class G airspace that triggered Bristow to pioneer the integration of ACAS2 into helicopters after a successful series of trials. For an overview of how military air accidents are investigated in the UK see this presentation given by the head of the Farnborough based Military Air Accident Investigation Branch (MilAAIB) to the European Society of Air Safety Investigators (ESASI) in 2012. The Service Inquiry Panel, the MilAAIB and the Director General MAA should be congratulated for a through investigation and analysis. Users of the airspace in the Moray area should be aware that since the accident RAF Lossiemouth has formed as Local Airspace Users’ Working Group. UPDATE 19 October 2015: In 2014 the probability of a mid air collision between a Typhoon and a commercial air transport aircraft was stated as being 1 in 680 per annum (of RAF operation), reducing to 1 in 5000 with a collision warning system. On 23 June 2014, a mid-air collision occurred over Olsberg North Rhine-Westphalia between a Luftwaffe Eurofighter Typhoon and a civilian Learjet 35, registration D-CGFI. The Learjet was operated by GFD, a German defence contractor that provide target towing and other training services. The Learjet and two Typhoons were involved in an interception exercise when the collision occurred between the Learjet and one Typhoon. 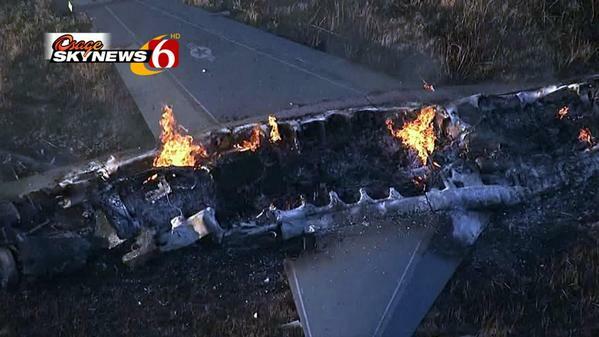 The civilian aircraft crashed and both crew members died. The damaged Eurofighter performed an emergency landing at Nörvenich Air Base. The Federal Bureau of Aircraft Accidents Investigation (BFU) has commenced its investigation. The Flight Data Recorder and Cockpit Voice Recorder from the Learjet have been recovered and recorded data from the Typhoon secured. In Germany, as in the UK, air accidents involving both civil and military aircraft are investigated by the civilian accident investigation body. UPDATE 7 October 2014: The BFU have issued their interim report. UPDATE 24 August 2015: We attended an excellent briefing by the BFU at the ISASI 2015 conference on their final report. Although not relevant in this case, in the UK it has been pointed out that the RAF does not have a CWS programme approved for the Typhoon (as it does now for Tornado). RAF use of the Tornado is currently expected to continue into the 2018/19 financial year. 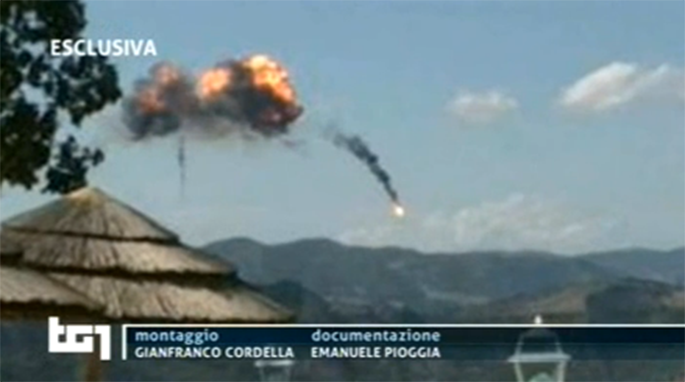 A collision between to Italian Air Force Tornados resulted in the death of two crew. UPDATE 22 October 2014: F-16s, US October 2014 Two F-16s of the Oklahoma Air National Guard collided with the loss of one aircraft. UPDATE 3 Dec 2014: A US Air Force Lockheed Martin C-130H and a Alenia C-27J came into contact over Fort Bragg. North Carolina, during separate night training missions but landed safety on 1 Dec 2014. UPDATE 22 March 2015: Details emerged on this accident. The European Aviation Safety Agency (EASA) received a request from the European Commission to investigate a series of near mid-air collisions between European passenger aeroplanes and military aircraft during recent months. These incidents have taken place over the sea at the border of the European Union (EU). As reported by different EU member states, the transponder of the military aircraft were inactive and it was not possible to establish a radio contact with them. This may have caused an immediate safety hazard to civil aviation. João Aguiar Machado, Director General for Mobility and Transport at the European Commission declared: “the support of EASA will be essential in further identifying appropriate solutions and follow-up measures to address such events at the European level”. Patrick Ky, EASA Executive Director said: “this is a very serious issue. We will consult and interview all the relevant civil and military bodies in order to gather the necessary information to complete our analysis”. The analysis will aim at identifying the causes of the near mid-air collisions and provide recommendations on how to minimise the potential safety impact of these events on civil aviation. EASA will deliver its recommendations to the European Commission in March 2015. …a controller directed the Viper [F-16] to turn 180 degrees near a small airfield near the town of Moncks Corner. A Cessna 150M had taken off and was ascending into the path of the F-16. The Air Force pilot had an obstructed view and insufficient time to avoid a collision. The investigation found that the controller’s direction to send the F-16 to a near uncontrolled airfield, the timing of those directives, and the pilot’s non-use of additional systems such as those that scan for civilian transponders contributed to the crash. The National Transportation Safety Board has already released its investigation. UPDATE 5 January 2017: The MAA have issued a Notice of Authorised Amendment (NAA 17/01) that introduces a revised Regulatory Article (RA) RA1205: Air System Safety Cases at Issue 5. 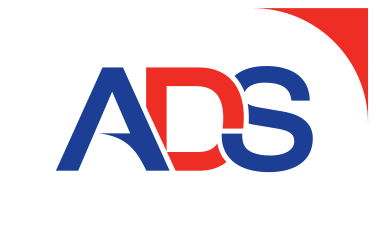 Among the changes is a new Annex A on Collision Warning Systems (CWS), flight recorders and Flight Data Monitoring to be addressed by Duty Holders in their ASSCs. the change follows “recommendations of Lynx and Tornado Service Inquiries”.